Whether through your phone, car or credit card, caught on a CCTV camera or tracked through your online viewing history, government agencies know where you are, and are quietly collecting your most intimate, mundane, and personal information. Is this even legal? The panelists will discuss what public governance models can help local governments protect the privacy of citizensand what role citizen technologists can play in shaping these models. The discussion will showcase the ongoing collaboration between the UC Berkeley School of Information and the Oakland Privacy Advisory Commission (OPAC). Attendees will learn how they can get involved in addressing issues of governance, privacy, fairness, and justice related to state surveillance. A reception will follow the panel. Please RSVP here to attend. This event is co-sponsored by the Center for Technology, Society & Policy and the Center for Long-Term Cybersecurity. Cyrus Farivar, is a Senior Tech Policy Reporter at Ars Technica, and is also an author and radio producer. 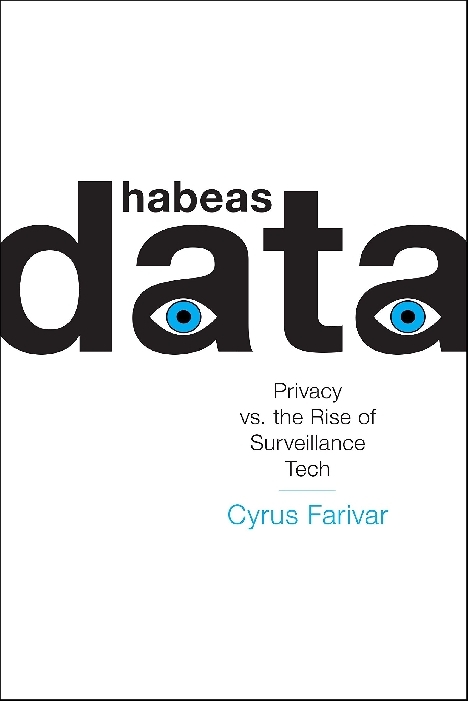 His second book, Habeas Data, about the legal cases over the last 50 years that have had an outsized impact on surveillance and privacy law in America, is out now from Melville House. His first book, The Internet of Elsewhereabout the history and effects of the Internet on different countries around the world, including Senegal, Iran, Estonia and South Koreawas published in April 2011. He previously was the Sci-Tech Editor, and host of "Spectrum" at Deutsche Welle English, Germany's international broadcaster. He has also reported for the Canadian Broadcasting Corporation, National Public Radio, Public Radio International, The Economist, Wired, The New York Times, and many others. Deirdre K. Mulligan is an Associate Professor in the School of Information at UC Berkeley, a Faculty Director of the Berkeley Center for Law & Technology, and an affiliated faculty on the Center for Long-Term Cybersecurity. Mulligans research explores legal and technical means of protecting values such as privacy, freedom of expression, and fairness in emerging technical systems. Her book, Privacy on the Ground: Driving Corporate Behavior in the United States and Europe, a study of privacy practices in large corporations in five countries, conducted with UC Berkeley Law Prof. Kenneth Bamberger was recently published by MIT Press. Mulligan and Bamberger received the 2016 International Association of Privacy Professionals Leadership Award for their research contributions to the field of privacy protection. Catherine Crump is an Assistant Clinical Professor of Law and Director of the Samuelson Law, Technology & Public Policy Clinic. An experienced litigator specializing in constitutional matters, she has represented a broad range of clients seeking to vindicate their First and Fourth Amendment rights. She also has extensive experience litigating to compel the disclosure of government records under the Freedom of Information Act. Professor Crumps primary interest is the impact of new technologies on civil liberties. Representative matters include serving as counsel in the ACLUs challenge to the National Security Agencys mass collection of Americans call records; representing artists, media outlets and others challenging a federal internet censorship law, and representing a variety of clients seeking to invalidate the governments policy of conducting suspicionless searches of laptops and other electronic devices at the international border. Prior to coming to Berkeley, Professor Crump served as a staff attorney at the ACLU for nearly nine years. Before that, she was a law clerk for Judge M. Margaret McKeown at the United States Court of Appeals for the Ninth Circuit. Camille Ochoa promotes the Electronic Frontier Foundations grassroots advocacy initiative (the Electronic Frontier Alliance) and coordinates outreach to student groups, community groups, and hacker spaces throughout the country. She has very strong opinions about food deserts, the school-to-prison pipeline, educational apartheid in America, the takeover of our food system by chemical companies, the general takeover of everything in American life by large conglomerates, and the right to not be spied on by governments or corporations. Steve Trush (moderator): As a member of the United States military and other federal government agencies, Steve Trush has spent over a decade supporting international security initiatives, with work ranging from data analysis and policy advising to technology development and training. A recent graduate of the Masters of Information Management and Systems program at the UC Berkeley School of Information, Trush recently held a research fellowship through the United States Agency for International Development (USAID), where he evaluated and designed agent-based data collection networks in rural areas of India and Myanmar with limited connectivity. Refreshments: Reception to follow the panel.